St. Joseph is the husband of the Blessed Virgin Mary. His appearance in the Gospels give the impression of a man who was just, compassionate, brave and self-effacing. He is the patron saint of families, of workers and all kinds of homes and hospices, as well as the patron saint of the dying. 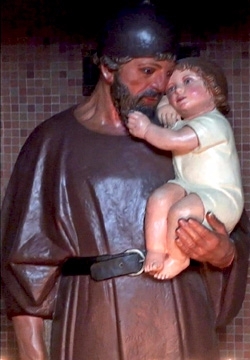 St. Joseph is the patron saint of 10 nations (Austria, Belgium, Bohemia, Canada, China, Croatia, Korea, Mexico, Peru and Vietnam) and also the patron saint and protector of the Church. Thank you, Joseph, the Lord’s quiet man. St. Joseph, watch over us day and night and keep us from all harm. Obtain for us health of mind and body. Through your intercession grant us a spirit of prayer and self-control, a love for Jesus in the Blessed Sacrament and for Mary our Mother. Be with us at the hour of our death. Amen.